Peter has been to the ER more than nine times in recent months after what his mother calls “explosive episodes.” He has violent outbursts and threatens to kill himself. Sometimes he gets sent home from the emergency room because he’s calmed down and said he’s sorry and appears to the staff to be ready to leave. Other times, his mom said, she’s taken him home after being told he had no chance of getting a bed in an inpatient psychiatric unit, even though he seemed to need that level of care. In addition to his psychiatric issues, Peter has a developmental disorder that places him on the autism spectrum. At one point, his mother, Kathleen Harding-Wheeler, decided she wouldn’t take him home. After a recent growth spurt, he’s more than 6 feet tall and 220 pounds, and she was worried Peter would hurt one of his four younger sisters during an episode. They spent three nights in the emergency room. But they were told there wouldn’t be an inpatient bed available through the weekend — another four days. So they left. “The mental health system in Connecticut is just a series of ER visits and hospitalizations, but there’s no continuity,” Harding-Wheeler said. Peter in his home in Rocky Hill. Some people have advised her to take more drastic action to get Peter the mental health care he needs. “People have said to us, ‘Bring him to the ER and don’t go back, don’t answer their calls, don’t do anything,'” Harding-Wheeler said. They’ve told her the Department of Children and Families would file neglect charges against her and her husband, and would find Peter a place in residential treatment while investigating. But she can’t bring herself to do it. Making her son feel abandoned doesn’t seem like the right way to help him. You’ve probably heard stories like this before. The number of children and teens going to emergency rooms in mental health crisis, some waiting days for an inpatient bed, has been growing for more than a decade. ER staff are used to seeing a bump in patients at the end of each school year. The emergency department entrance at Connecticut Children’s Medical Center in Hartford. But what happened this spring was unprecedented, say people who work at Connecticut Children’s Medical Center, parents of kids with psychiatric illnesses and community mental health providers. “I don’t remember a period like that before where the volume was so high and we had so many kids where there wasn’t a place to facilitate them to, there wasn’t a place for them to go to,” said Gary Steck, CEO of Wellmore Behavioral Health, based in Waterbury. At one point, Steck said, he was told there were a couple dozen kids stuck in the system, waiting to get into a higher level of care. Dr. Lisa Namerow called it a crisis several years ago when there were five kids spending four days in the ER at Connecticut Children’s. Now it’s worse. Some days this spring, there were 20 kids waiting for a place to go or for an evaluation. And the number waiting three or more days in the ER has reached new highs. “We’re running out of adjectives,” said Namerow, a child and adolescent psychiatrist at the Institute of Living who directs the child psychiatry consultation services at Connecticut Children’s in Hartford. Data bear it out. In 2000, the Connecticut Children’s ER had an average of 54 psychiatric visits per month — the equivalent of less than two children and teens per day. Last year, it was up to an average of nearly seven per day, or 207 per month. The number of psychiatric visits tends to fluctuate from month to month, rising with the school year and dropping in the summer, as it has this year. But this May, the ER set a new record: 367 psychiatric visits. At least one child stayed for nearly 10 days. Psychiatric visits to the emergency room at Connecticut Children’s Medical Center in Hartford have grown dramatically since 2000. More children are also waiting longer in the ER, often because of difficulty getting into a psychiatric hospital bed. So far, 2014 is on pace to have the highest volume of visits — and the number of visits in May (367) was a record high. Typically, psychiatric visits are lower in the summer and higher during the school year. These charts show the total number of psychiatric visits to the ER, the number of patients who were there overnight, and the number who were there for two days or more. Some mental health care providers link it to an increase in the number of children with mental health needs. Others see a greater willingness to recognize problems because awareness of mental illness has grown. Some see a link to the increase in family stress that comes with a bad economy. Some note that school personnel have become more apt to send a child for an evaluation if they have concerns. “A child might live in this room for 11 days,” psychiatrist Lynn Mangini said in the Connecticut Children’s emergency department. And some clinicians, including Namerow, see a link to the push in recent years by the state Department of Children and Families to have more children and adolescents living in family settings, rather than in residential treatment or group homes and other types of congregate care. Clinicians and other mental health providers say they agree with the goal, but that without adequate services to support those young people in the community, the shift can produce problems for the kids, with ripple effects for the rest of the system. Department officials caution against drawing a connection. The recent surge of young people in need comes as state officials work to develop a comprehensive plan to meet the behavioral health needs of children, required under legislation passed in the months after the Newtown shootings. Emergency rooms don’t exist in a vacuum. They’re often where problems in the rest of the mental health system become apparent — where patients go when there isn’t enough access to care or the right type of services, noted Judith Meyers, president and CEO of the Child Health and Development Institute of Connecticut. “It’s sort of the squeaky wheel,” she said. This spring, the ER at Connecticut Children’s squeaked. This is what it looked like. Because there weren’t always enough rooms for all the children with mental health needs, some stayed on stretchers in the hallway. Parents stayed overnight in their children’s sparse rooms or slept on Barcaloungers in the hallway between kids in stretchers. “It’s like walking into a train station sometimes,” said Dr. Lynn Mangini, a child and adolescent psychiatrist at the Institute of Living and Connecticut Children’s. Kids come to the Connecticut Children’s emergency room for a wide range of mental health reasons — from having had a fight with a friend and not knowing how to cope to having an acute psychotic break or showing signs of schizophrenia. Some are teens and the size of adults. In May, 30 percent of the psychiatric patients were under 13. Staff said that while some were frequent visitors, many were patients they’d never seen before. They don’t come because the emergency room is the best place to get mental health care. In fact, there’s no regular psychiatric treatment there. So why do they go there? “Right now, the care of these patients is being undertaken by the hospital because we have an emergency department and we can’t refuse anyone that comes to our door,” said Dr. John Peng, the emergency department’s medical director. Security officer Francisco Rodriguez tries to get to know psychiatric ER patients to help head off problems. It’s intended to help the patients and protect staff. To adapt, Mangini and her colleagues try to do more. 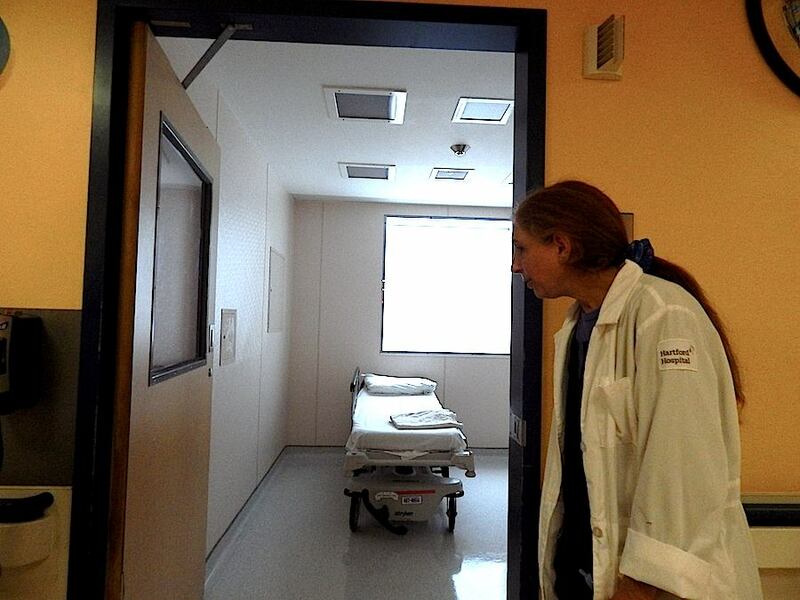 She tries to treat the patients stuck waiting for inpatient care as if they’re inpatients in the ER, going further into their histories than is typical in emergency room visits, trying to understand what’s behind a patient’s presentation. If he looks psychotic, was it because of substance abuse, or a neuropsychiatric illness like bipolar disorder? “You don’t want to do that unless you absolutely have to because we’re not in a milieu where we can observe these patients,” she said. The patients are waiting in small rooms, not in a place where they’re getting therapy and developing coping skills. Other patients they try to stabilize and send home if they can get the right services in place — something Mangini said is really the job of a crisis stabilization unit, not an emergency room. The hospital is adapting in other ways too. It is in the midst of a $6 million construction project to expand the emergency department because of the behavioral health demands and to create a safer area to care for patients with mental health issues. It will mean safer patient rooms and safer bathrooms. Peng said the existing ones are problematic. “The faucets stick up so you could wrap something around the faucet and wrap it around your neck and try to hang yourself,” he said. In the past year, the hospital hired security officers with backgrounds in behavioral health, who try to head off problems or calm patients by getting to know them and learn their triggers. Sometimes that means giving a patient a snack, playing games with them or letting a patient know he has someone there for him. The hospital has increased staff because of the volume and acuity of patients with mental health needs. Each psychiatric patient must be under constant observation in the ER. Some try to harm themselves. If they shower, the bathroom door must be open a crack so a “sitter” can be sure they’re safe. The emergency room has 36 beds. Although the volume of psychiatric patients has dropped recently, as it typically does during the summer, there were times in the spring when there were just 10 beds for medical patients because every other room was taken by children with behavioral health needs, said Dr. Michael Soltis, an emergency physician. Often, the psychiatric patients were waiting for somewhere else to go. This sticker is not decorative. It marks where children can stay if all the rooms in the ER are full. This spring, it was not uncommon for children to be staying in the halls, staff say. “It really decreases our capacity to manage all the other medical patients that come through our doors,” Peng said. But the most tragic part, as he puts it, is what happens to the psychiatric patients. They’re not getting treatment. They’re not getting educated. “They’re basically confined to a room. They’re under constant observation,” Peng said. “They may live here hundreds of hours,” she said, using a term not typically applied to ER patients. And spending days in the emergency room can make patients’ underlying problems worse, particularly when it’s crowded. Kids see other patients leave and get agitated wondering why they’re still stuck there. Some have moms who stay the whole time, while others never get one visitor and wonder why the kid in the next room did. Seeing a child in crisis in the hallway can hinder another child who’s trying to hold it together. “Right now it seems that the system is broken and there are things that can be done,” Peng said. In 2007, the ER got some relief when a six-bed unit at the nearby Institute of Living opened to provide assessment for young people awaiting inpatient beds or outpatient services. The unit, Child & Adolescent Rapid Emergency Stabilization Program, or CARES, helped, people who work in the ER say. But now, even that unit is regularly full. Often, the children and teens stuck in emergency rooms are those who have the hardest time getting into an inpatient unit, including those with moderate to profound autism or a developmental disability in addition to a psychiatric illness, Mangini said. Sometimes they’re children who are very aggressive or sexually reactive. Sometimes the only options for them are inpatient units in other states. But families can’t always make that work, particularly if they don’t own a car or don’t speak English. Finding a bed can be hard even for kids without those barriers. The first time Carol Poehnert’s teenage son needed to be hospitalized, he spent close to 30 hours in the ER while staffers tried to find an open psychiatric bed. “They did come back and tell us there was an opening in Vermont,” Poehnert, of West Hartford, said. She said no: She knew nothing about the program and was worried about sending her child out of state. He eventually got a bed at a hospital in Connecticut. Now, with nearly two years more experience dealing with a mental health care system she considers broken, Poehnert thinks differently about the Vermont option, a highly regarded program. “I probably should’ve taken it,” she said. It’s not just the ER. Some community mental health providers say they’ve seen an increase in young people with significant mental health needs too. “We all are definitely seeing a huge number of referrals and a lot of pressure and kids that a decade ago certainly would’ve been in a much higher level of care,” Steck, of Wellmore, said. And his agency, like other nonprofits that contract with the state to provide mental health services, is doing it without new resources, after years of flat funding. Richard Calvert’s agency, the Child & Family Agency of Southeastern Connecticut, has been seeing more kids considered at risk of suicide or psychotic breaks. Lower-intensity settings like child guidance clinics or school-based health centers, which the agency runs, are increasingly treating kids who in the past would have been in residential treatment or group homes, said Calvert, the chief operating officer. The staff are often working “at about 125 percent of what we consider really good volume of service delivery,” and seeing children with more complex cases, Calvert said. Often, they’re from families dealing with multiple struggles in addition to mental health issues. “Poverty, food, housing, joblessness, transportation, you name it,” he said. So staff work harder. More complex cases mean more planning and supervising time. There are also more concrete changes to reflect the higher level of need among clients. Agency leaders are thinking about creating multiple waiting rooms, since there’s a big difference between clients with relatively routine issues and those in acute situations. If a child has an outburst in a private office, he might be heard in the waiting room three insulated walls away, Calvert said. They’ve thought about changing floor plans, mindful of ways to better usher ambulance staffers into the clinic without having to bring them through the waiting room. They’ve been installing punch code locks in buildings because of concerns about clients walking around the building unescorted. For the staff’s safety, some kids who were once seen at family-convenient 7 p.m. appointments, when there were just two clinicians in the building, now get earlier appointments to ensure there are multiple staff around for backup if needed. “There’s just a thousand of these details,” Calvert said. The increase in ER volume has happened in spite of other programs intended to divert kids from emergency rooms, like the state’s emergency mobile psychiatric services, care management for patients in the state’s Medicaid program and other initiatives that Mangini said are helping. Lately, Mangini said, more children who don’t have the typical barriers to access are also waiting longer in the ER. That’s part of why she and Namerow believe the problem is related to a lack of access to inpatient beds. To them, the problem seems to be linked to changes in state policies on congregate care. Young people in inpatient psychiatric units can’t be discharged if there’s no safe place for them to go. And with a shift away from the types of settings they might have once gone to after a hospitalization, such as group homes or residential facilities, some kids in inpatient units are waiting longer to get out. That means there are fewer available beds for others who need them. Besides that, Mangini said, services for some of the highest-need kids have decreased. In some cases, it can take weeks for a child or teen to get into a partial hospitalization program, an intensive program for those who are not inpatients. It should take days, she said. Officials at the Department of Children and Families caution against drawing a clear connection between the recent increased strain on the mental health system and the department’s efforts to reduce the number of kids in congregate care. Department officials speak proudly of reducing the number of kids in congregate care, down by 41 percent since 2011. Commissioner Joette Katz often says that children should have breakfast with the same people who put them to bed the night before, rather than living in settings with staff who work shifts. More children are receiving mental health services, therapy to address trauma and other supports in their homes. Mental health care providers say the goal is a good one, but some worry about whether there are enough services in the community to support the children and teens properly. Kristina Stevens, administrator for the clinical and community consultation support division at DCF, said people shouldn’t draw a clear line between the recent surge in ER visits and the department’s changes. Deputy Commissioner Michael Williams said the work to reduce the use of congregate care has nothing to do with the availability of inpatient beds. But he said that lack of resources shouldn’t mean a child should have to go into a congregate setting. Williams acknowledged that there are kids who spend more time in inpatient care while waiting for a family setting, but said it doesn’t happen in the majority of cases. Officials are reviewing why some kids are getting stuck in ERs for a significant amount of time, and what could help, Stevens said. She said they’re outliers. Data from the state’s Behavioral Health Partnership, which provides mental health coverage for Medicaid clients and youth involved with DCF, show the changes in how young people have been served. The number of residential treatment admissions among youth covered by the program dropped by 45 percent from 2008 to 2013. The rate of young people served by some intensive outpatient mental health programs has fallen in recent years, while the use of home-based services increased. But the number of children and adolescents in the program stuck in emergency rooms rose by 20 percent from 2012 to 2013, and the frequency of youth in the program spending more than one or two days in ERs has also been rising since 2010. Still, Karen Andersson, DCF director of the Behavioral Health Partnership, noted that the average amount of time those kids spend in emergency rooms when stuck has stayed fairly consistent over the past five years at 1 ½ days. “That sounds horrible, but it’s a lot better than when we started back in 2007,” she said. “The system is in an odd way to be credited for absorbing this increase in volume but at the same time getting the kids processed and out the door where they need to be,” whether to an inpatient unit or back home with services, she said. Harding-Wheeler hasn’t yet found that for her son. To her, it feels like her family is in a cycle that never leads to Peter getting the help he needs. They’ve tried just about every program they can, she said. The ER visits got more frequently recently, after he hit puberty and grew substantially, becoming too big for his parents to handle physically. Now, if he has an explosive episode, they call the police, who call an ambulance that takes him to the ER. “The frustrating thing is, the ER visit, there’s nothing they can do there,” said Harding-Wheeler, who lives in Rocky Hill. They’ve told police they feel bad calling them because they know the officers have other things to do. But in the moment, Peter could hurt someone. Harding-Wheeler worries about her other children, who range from 5 to 11. At one point, Peter spent two weeks as an inpatient at the Institute of Living. He saw a therapist he liked. The prescriber there worked well with the family. Peter began attending groups. His medication was changed. But when he got discharged, all that fell away. He returned to his old psychiatrist, who didn’t have any discharge notes that would explain what happened during the hospitalization, and who put him on the old medications. Transitions between services are particularly problematic. Peter now receives services in the family’s home. “By the time anything gets started, we have now had a week where basically we’re on our own because he hasn’t been to the psychiatrist, his medications aren’t working, this new in-home service hasn’t started seeing him yet, and so we’re back in the ER again,” Harding-Wheeler said. And there’s no one professional following Peter’s care. The psychiatrist only sees him for 15 minutes at a time. Harding-Wheeler worries the system is giving up on her son. Peter and his mom, Kathleen Harding-Wheeler. She knows other people whose children have had similar problems, hurting siblings or their parents, cycling in and out of the ER without resolving anything. Most with older kids have told her that eventually, the police stopped asking the parents what they wanted and arrested the kids. “You can’t believe how many people have the same story we do,” she said. One thing has been giving her hope. She recently got a call from her insurer, Anthem Blue Cross and Blue Shield, about a program for people who use the ER a lot. Arielle Levin Becker covers health care for The Connecticut Mirror. She previously worked for The Hartford Courant, most recently as its health reporter, and has covered education and municipal beats for The Courant and the Home News Tribune of East Brunswick, N.J. She was a finalist in 2009 for the prestigious Livingston Award for Young Journalists, a recipient of a Knight Science Journalism Fellowship and the third-place winner in 2013 for an in-depth piece on home caretakers from the National Association of Health Journalists. Her first job in journalism was at a homeless newspaper in Seattle. She is a 2004 graduate of Yale University.